Posted on September 14th, by Dr Rob Yeung . And what about these other statements? The statements are derived from a psychometric questionnaire originally created by researchers Michael Kernis and Brian Goldman. All ten statements measure what is known as authenticity, which is the extent to which you are “real” as opposed to putting on a show and pretending to be something that you’re not. Authenticity is a continuum, a spectrium. 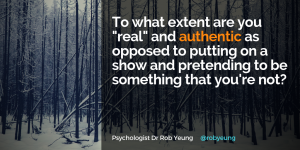 So you’re not either “authentic” or “inauthentic”. You are more authentic if you agree more strongly with the first five statements. You are also more authentic if you disagree more strongly with the second set of five statements. People who are more authentic tend to spend more time thinking about what they truly need and want in life. They are also more open in talking about their needs, beliefs, strengths and weaknesses. People higher on authenticity are more likely to speak up or to say “no” even when it might disappoint other people or perhaps cause offence. I’ve written in the past on the benefits of authenticity. For instance, leaders who are more authentic tend to get better results from their teams. However, research led by Amy Brunell of the Ohio State University at Newark has found that people who are more authentic tend to have happier relationships, too. In their study, Brunell and her collaborators looked at 62 heterosexual couples and found that couples who were more authentic tended to engage in healthier relationship behaviours. For example, couples who scored lower on authenticity were more likely to ignore each other or sulk when things were not going well. As a result, couples who were more authentic tended to report higher levels of psychological well-being. If you would like to have a healthier relationship and feel happier, think about your own behaviour. How could you behave more authentically? To what extent is that statement true for you in your relationship? Can you think of a time when you felt or behaved less authentically with your partner? In that situation, what pressures did you feel under? How did you feel about whatever happened in the end? And finally, what might you do in order to feel more authentic with your partner in the future? For example, the very first statements says: “I want close friends and family members to understand my weaknesses and flaws.” So to what extent do you talk about your worries, problems and mistakes with your partner? What stops you from sharing more? And how could you behave more authentically from now on? Being more authentic tends to be associated with more honesty and openness. However, being honest does not mean being rude about what you want or what you don’t like. Instead, it means sharing your concerns and desires more frequently as opposed to having to pretend to be something that you are not. This isn’t a quick exercise that you can do in just a few minutes. But if you are serious about improving the quality of your relationship – as well as your own well-being – then do give the matter more thought soon.